. : Eload Marathon Report #1 - NorAm Easterns Canadians - Distance Classic Pursuit :: Ski XCOttawa.ca :: Skiing in Ottawa and Gatineau Park :. Day three of racing on this past Sunday, wrapped up the Haywood NorAm Eastern Canadian Multistage event at the Nakkertok race site in Cantley, Quebec. To finish off the big weekend of racing, the exciting challenge was a Distance Classic Race Handicap Pursuit Style start based on the previous days races. Team XC Ottawa has been having a stellar weekend thus far, feeling pretty comfortable on what we could call our "home turf". This race was no different and the Team fought hard all the way to line for some very impressive overall finishes on the weekend. Up first were the XC Ottawa men, bright and early for a little after 9am start. It was a little colder arriving to the race site today but luckily the sun was trying to break free and we were approaching the optimal temperature for classic style racing. The Open Men category really got their money's worth today and went the distance of 6 x around the 5km challenging loop, making up the 30km event. Xc Ottawa's top finisher was Lee Hawkings, moving up to 17th place overall. Another impressive weekend from Leeland. Karl Saidla also having a good day finishing in the 26th spot overall. Matthias Purdon fought hard to finish in 38th place and Peter Beisel made up some good ground to move in 41st place. Kyle Power and Logan Potter finish the day in 46th and 51st place overall. A little later around mid-morning it was time for the XC Ottawa women to take on their 15km Classic event, enduring three hard laps of the 5km loop. The temp was warming as the women started and the fairly skied in course, resulted in a touch up of the wax for the girls. Later in the article Coach Suuronen will reveal his secrets. For now back to the XC Ottawa women who been having a pretty rockin' weekend. Especially, Megan McTavish who had great races the first two days and then even moved up from 8th to 6th place overall in the multi-stage event. Sheila Kealey race well to finish 18th overall in a strong womens field. And not far behind was Vesta Mather who finished up the day in 27th spot, having a good weekend of racing. Kyla Vanderzwet and Anna Geiger-Whitlock skipped out on Friday's races so they started in the 15km Mass Start. They finished 56th and 59th overall. It was certainly an awesome weekend of racing put off by the Nakketok club! XC Ottawa had some great performances but we could not of done it without our amazing support system. Thank you to our sponsors, Eload/Emend! The Eload and Fly combo is delicious for long distance racing and a key component to having a good race over such a grueling 15km/30km course. I for one, also really enjoyed my eload gel mid race! As well thank you to our waxing volunteers and feeders. John Langstone, Craig Storey, Nevin French and Ingrid Hagberg - you guys helped make it happen! Enjoy the photos. Team XC Ottawa is resting and preparing for more NorAm racing in Orford next weekend. Be sure to check back for those results next week! Beautiful day for a ski race! Matthias getting ready for the start of the 30km. Focused. Lee Hawkings and former XC Ottawa'er Colin Abbott seem to be having a little bit of an on-going battle this season. Today they really got to duke it out skiing most of the 30km together! Here we have Karl, the ketchup to the Quebec sandwich. The blurr says these dudes were not moving slow today! Craig cheering on Matthias, who is punchin' it pretty hard here! Megan McTavish standing proud on the overall Women's podium! Way to take home the bacon! Photo Cred: AJL Ski photos. Added by the Leblanc Family. And NO, of course I didn't forget the most important man of all. Just saving the best for last. 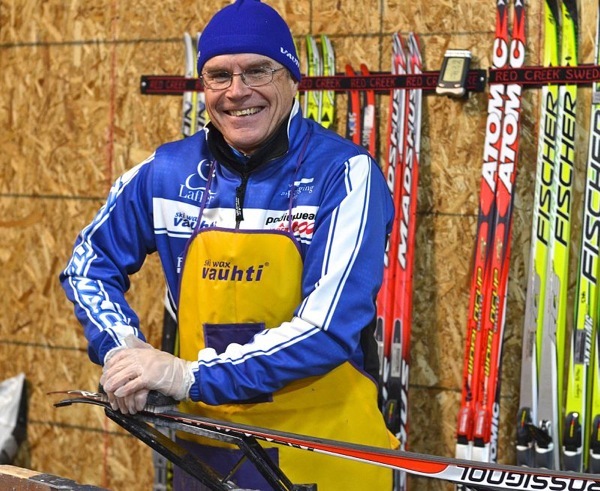 Our coach, John Suuronen! Another huge thank you to him for all of his hard work and making sure we are always on our game! Thanks for reading. Happy Skiing and Racing! Race Report: 2006 Keskinada Report #1 - Lesson learned at Keski 2006: Don’t miss the train! Editorial: Perianne Jones - The Making of a Champion: Hurry up and Wait! XC News: Andrew Wynd qualifies for the World Championships again!